If you have outdoor workers or staff that will have to venture out into the elements during an especially cold winter, you need to make sure you are taking the correct precautions to keep them safe. If the conditions are extremely harsh, your workers are at heightened danger of injury, or worse. But even if you have employees who are outside for short periods, they can also suffer injuries if they are not prepared. Check the forecast – A supervisor should check the forecast for the next day before the end of the shift the day prior, to alert workers about any precautions they should take. Wear three layers of clothing. Start with insulating underwear – which traps perspiration – a middle layer that protects the body from precipitation, and an outer layer that allows ventilation and prevents overheating. Cotton is not always a good choice. Wool, silk and some synthetic fabrics are better at keeping skin dry even when it’s raining or the worker is sweating. Wear loose clothing. Tight clothing can trap moisture and lower body temperature. Protect your extremities. That means head, hands and feet. Wear a warm cap or hat, insulating gloves and two pairs of socks and insulated shoes. Carry an extra set of clothing in case something happens and a worker has to change. Train workers – They should be trained on how to prevent and recognize cold-stress illnesses and injuries, and how to apply first aid treatment. Workers should be trained on the appropriate engineering controls, personal protective equipment and work practices to reduce the risk of cold stress. 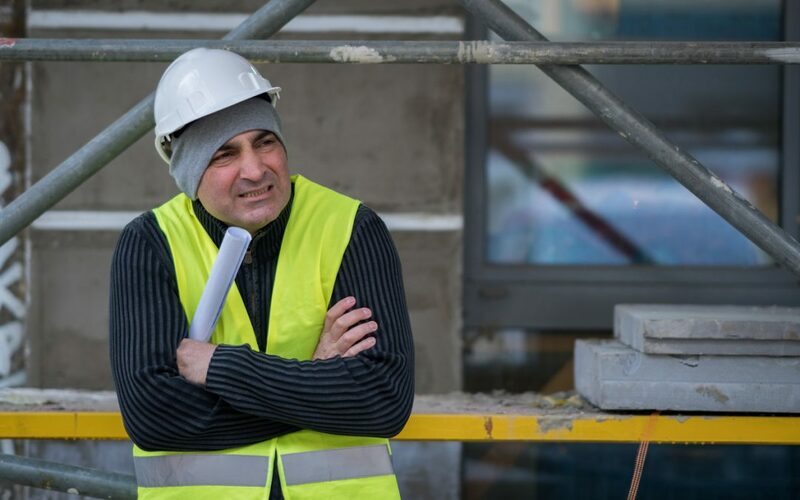 Workers should be aware of their body signals – Teach your employees about the symptoms of frostbite, hypothermia and dehydration and report any symptoms they are experiencing to supervisors, who should know how to summon help and protect the worker. The worker may begin to shiver and stomp their feet in order to generate heat. As the body temperature continues to fall, symptoms will worsen and shivering will stop. The worker may lose coordination and fumble with items in the hand, and become confused and disoriented. They may be unable to walk or stand. Loss of consciousness can occur. Reddened skin develops gray/white patches. Numbness in the affected body part. The affected part feels firm or hard. Blisters may occur in the affected part, in severe cases. Eat healthy, stay hydrated – Employers should stress the importance of a healthy diet to help workers power through harsh weather. They should be told to regularly drink warm water or warm sweetened fluids throughout the day. Ask that they always eat breakfast before working outside, to give the body the fuel it needs. Also ask them to avoid excessive drinking the night before work.